According to Jay Rayner in The Observer, Zest is “a jewish restaurant serving really good food.” Jay, I agree entirely. I had high expectations (which were met in full) since not only had I heard great things, but the chefs were behind one of my favourite places for brunch, Made in Camden. The staff could not have been more attentive and friendly. 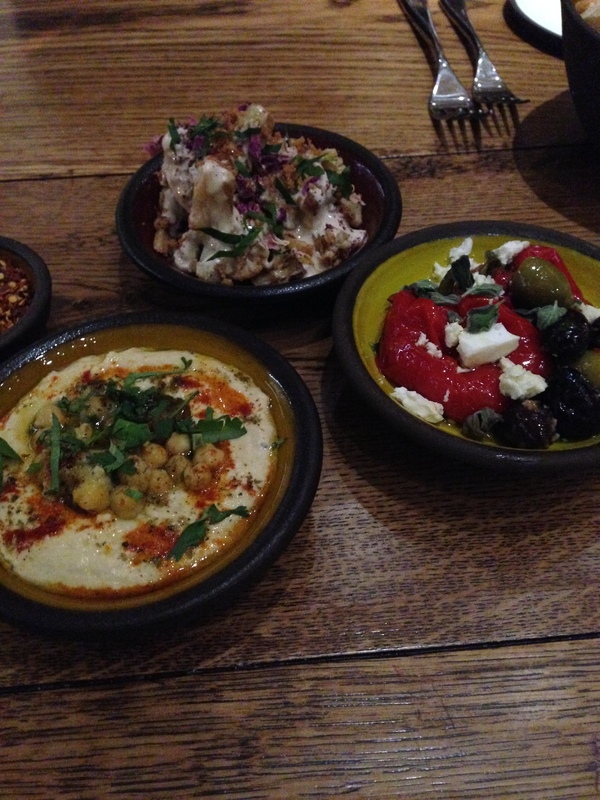 We took their advice and shared a mixed mezze (£9) to start, comprising cauliflower in a sauce of tahini and pomegranate molasses, marinated red peppers with feta and oregano and hummus mesabaha with paprika and zhug. For those of you who, like me, did not know what zhug or mesabaha was: zhug is a Middle Eastern hot sauce originating in Yemeni cuisine and brought to Israel by Yemenite Jews. It is now a staple of Israeli cuisine and is made from fresh hot peppers seasoned with coriander, garlic and various spices. Hummus mesabaha is like cousin of hummus, made from very similar ingredients but different in texture and taste. The chickpeas are cooked until extremely soft then mixed with tahini, olive oil, lemon juice and spices, often with some pre-made hummus added in. According to Google, “ideally, the soft peas should melt in your mouth, while the tahini and olive oil linger over your chin and onto your shirt.” I’m glad to say I didn’t spill anything on my shirt, but it was very enjoyable nonetheless. My favourite was the cauliflower, simply because it was a taste that was completely new to me, but all were truly excellent. 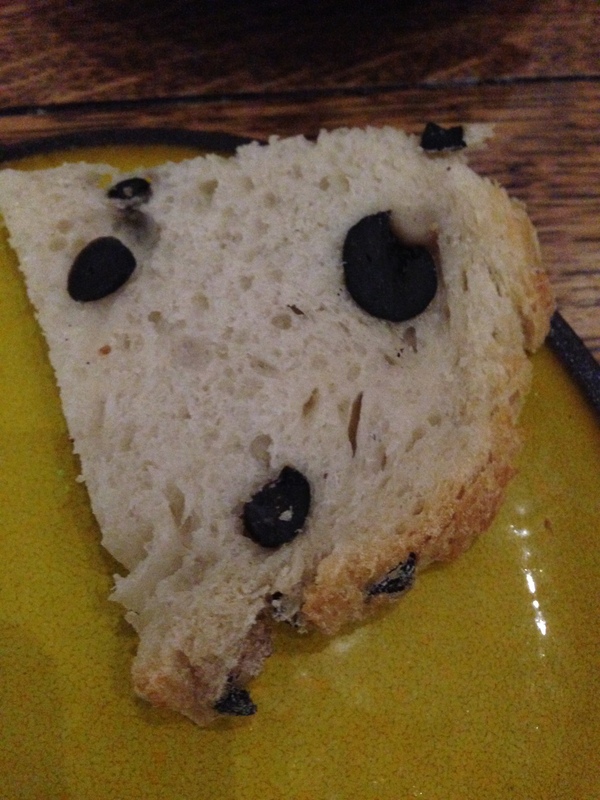 The mezze came with a bread basket that featured a fantastic olive bread. 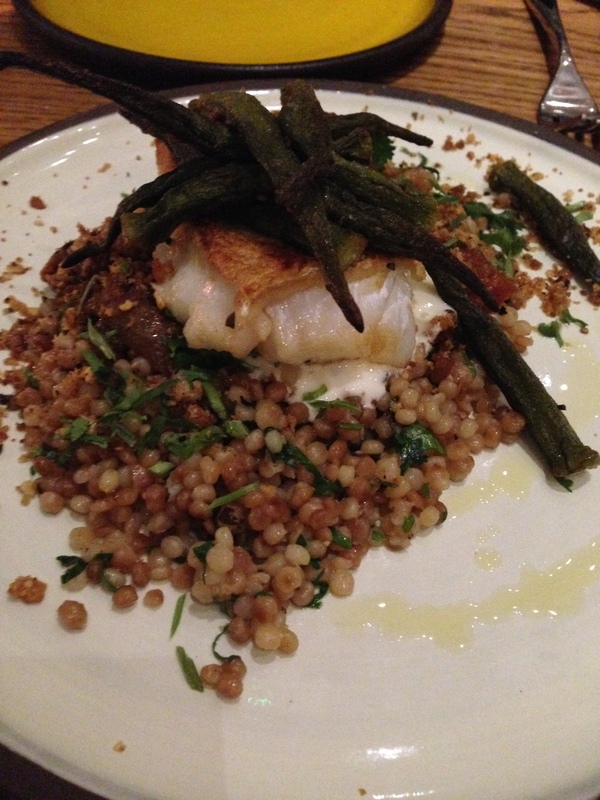 We then shared oven-roasted cod (£15.95) and a beetroot salad (£10.50). The cod was served with tomato and okra braise (braise referring to the cooking method), caramelised aubergine, ptitim and pangrattato. Ptitim is an Israeli toasted pasta shaped like rice or little balls; aka Israeli couscous. Pangrattato refers to breadcrumbs. I LOVED the cod and ptitim. I am so ambivalent about non-Israeli couscous but for some reason I am really fond of this couscous and the whole dish worked so well together. 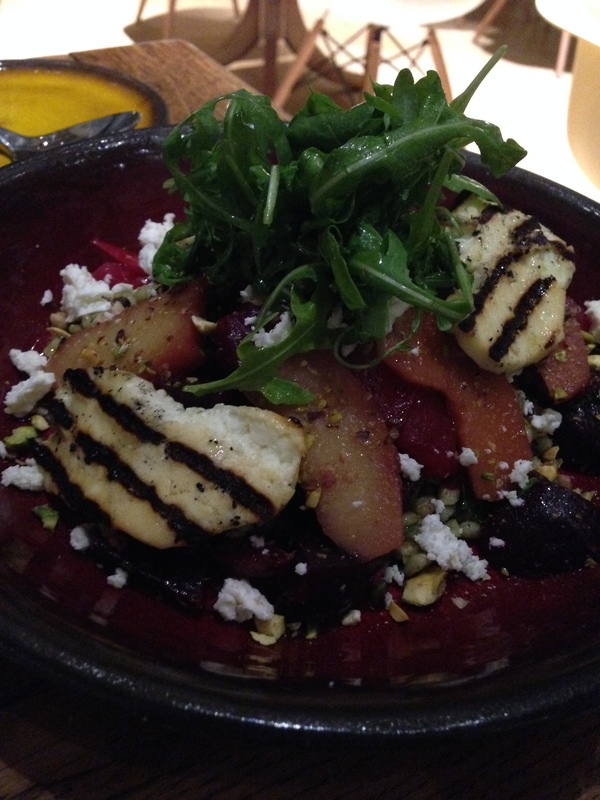 The beetroot salad comprised marinated beetroot, poached quince, pearl barley, rocket, grilled halloumi and pistachio. It was again very good. We were pretty stuffed but couldn’t resist trying just a mouthful of the sweet potato sfinges (£6.50) out of curiosity. As mesabaha is a cousin to hummus, a sfinge is brother to a small doughnut without the hole. 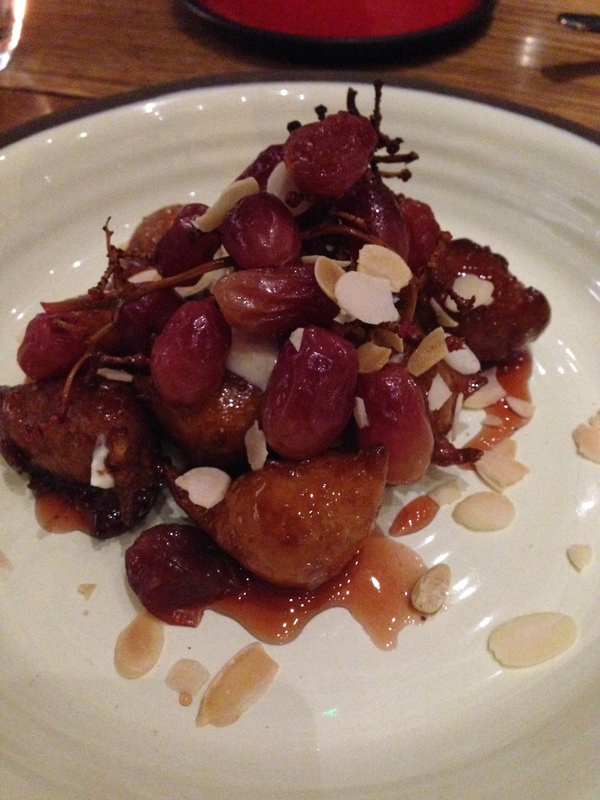 This particular sfinge comes hot with glazed black grapes, creme fraiche and flaked almonds. It really was something special. I’ve never in my life seen or heard of cooking grapes, but it is now something I plan to do frequently. The elements of the dessert all worked extremely well together. I thoroughly recommend Zest. 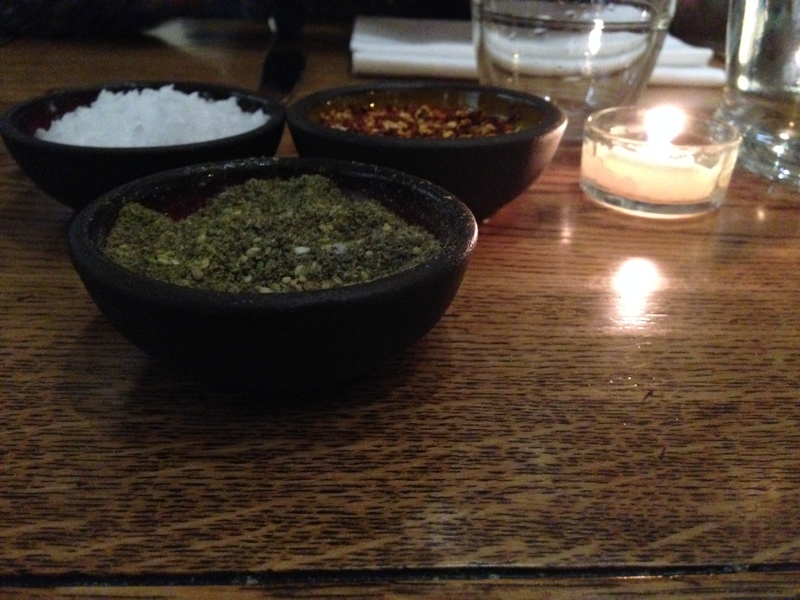 It is a tad on the expensive side (our bill came to roughly £70 for two people, which included a glass of wine each) but Kosher food is always expensive, and the quality of the food and the attentive staff make it entirely worth it and a delightful dining experience! This looks more like an Israeli/Middle Eastern Restaurant, rather than a Jewish one. Thank you for sharing. Feel free to visit my Israeli blog (new here but has been running for over a year on FB). Thanks Michal – you’re right! See update to the first paragraph.